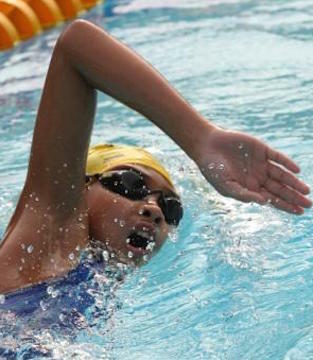 Although freestyle refers to any stroke except breaststroke, butterfly, or backstroke, the front crawl (which is discussed here) is most commonly chosen among swimmers. This stroke is generally the fastest and easiest to learn. Hold on to the side wall with both hands and put your head in the water. Kick while keeping the feet at surface of the water. Keep your legs straight. Kick from the hip. Point your toes. Start breathing sideways followed by exhaling when your heads turns inside the water. Slowly trasition towards floating on stomach. Repeat the breathing motion on your stomach and practice. Point your fingers forward. Elbows higher than your wrist. Press down with your forarm and push the water backwards. As your arm exits the water, bend your elbow keeping it high while keeping it relaxed. Faster arm stroke doesn't improve your swimming speed. Longer efficient strokes are better than shorter aggresive ones. Keeping fingers forward, your hand should accelerate from front to back while pushing the water backwards. Your hand should come out of the water near your hip to get the full efficiency. If you want to swim faster or just want to feel as though you are improving, then concentrate on your stroke technique. Strokes should look smooth without too much splashing. However there are common mistakes which people make in this stroke like not rotating hips, dropping the elbow, and breathing incorrectly.